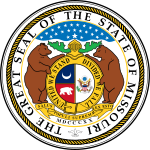 The 1964 United States presidential election in Missouri took place on November 3, 1964, as part of the 1964 United States presidential election. Missouri voters chose twelve representatives, or electors, to the Electoral College, who voted for president and vice president. 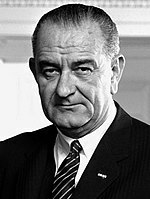 Missouri was won by incumbent President Lyndon B. Johnson (D–Texas), with 64.05% of the popular vote, against Senator Barry Goldwater (R–Arizona), with 35.95% of the popular vote. As of the 2016 presidential election[update], this is the last time that Perry County, Holt County, Lawrence County, Jasper County, Polk County, Greene County, Cooper County, Newton County, Cape Girardeau County, Barry County, St. Charles County, and Barton County voted for the Democratic candidate. ^ "United States Presidential election of 1964 - Encyclopædia Britannica". Retrieved May 30, 2017. ^ "1964 Election for the Forty-Fifth Term (1965-69)". Retrieved May 30, 2017. ^ "1964 Presidential General Election Results - Missouri". Retrieved May 30, 2017. ^ "The American Presidency Project - Election of 1964". Retrieved May 30, 2017. This page was last edited on 14 December 2018, at 17:27 (UTC).